Guide to FileMaker Upgrades. This page is about what you get in the various versions of FileMaker released since FileMaker 5 in the 90’s. Every time a new version of FileMaker comes out, I update this page and tell you what’s new. I pick my favorite features in each new FileMaker release. I’ll tell you now that FileMaker 15 is great upgrade, though not flashy and not as big as prior FileMaker upgrades that often took two years to build. Nowadays, FileMaker Inc. upgrades FileMaker annually to keep pace with MacOS and iOS annual upgrades. Before you go upgrading, though, check these notes first. This is a big upgrade that rivals FileMaker 7 in the scope of its changes but is a much more trouble-free upgrade. It includes a beautiful, powerful and forward-looking makeover of the design surface of FileMaker enabling much better graphics for the user interface. If you are upgrading from FileMaker 11 or earlier you’ll want to go all the way up to FileMaker Pro 15 if you can get your Macs up to MacOS Yosemite or higher. No mix and match allowed as far as pre FileMaker 12 and really if you start introducing new FileMaker 15 features, you’ll want everyone to be able to take advantage of them. We strongly recommend you do a trial conversion when going from 6 to 7 or higher or going from 7-11 up to 12 or higher. Then while running this experiment, run your usual reporting and whatnot to make still works. Once done testing thoroughly, you can convert with confidence and go live with your database. FileMaker Fever. Janet’s FileMaker Fever blog is another resource for you. Please keep an eye on it (subscribe to the RSS feed or drop by from time to time). Studio Manager. If you are a prospective or current Studio Manager customer, don’t miss Janet’s Studio Manager Story blog as well. I have to admit that I was surprised how quick FileMaker 15 came out this year. It used to be you would wait 18 to 24 months for the typical upgrade. Well, that’s history. FileMaker 14 released in May 2015 and now FileMaker 15 released in May 2016. Apple decided to do annual upgrades to help them keep up with the latest features released annually in MacOS and iOS. FileMaker Pro 15 and its counterpart on iOS FileMaker Go 15, are solid updates. While FileMaker Pro 12 was brand new and had lots of room for improvements in subsequent upgrades, version 15 is a mature, powerful, streamlined release. As a result, FileMaker focused on deeper bigger under the hood upgrades like FileMaker Cloud, the Scripting Workspace, Security and Better UI of FileMaker itself. These are all great and desirable features. FileMaker Cloud makes it possible to pay as you go and just get some cloud service from Amazon (AWS). You get Amazon’s awesome backups happening like clockwork with an easily adjustable server in the cloud that you can tweak up and down as your needs vary perhaps seasonally or based on specific events. If you are heading towards a FileMaker Server hardware upgrade, think twice if you don’t have the right support to make sure this mission critical infrastructure is perfectly tended. Too many horror stories about backups that weren’t quite right, make me inclined to recommend this new FileMaker Cloud. Security with Touch ID. How about employees having an account and password and having the option to require Touch ID as in fingerprint to really lockdown your database without making it at all difficult to access? Sure glad my fancy new MacBook Pro with Touch Bar has Touch ID! Scripting Workspace. FileMaker decided to devote a bunch of attention to scripting. In this case, their big feature that I’m crazy about is they turn any errors red. You start scripting an immediately know if you’ve introduced an error. Or, you open an old script and see there is an error before you’ve tried to figure anything out. Ease of use is good for scripting because that’s where some of the coolest functionality is delivered. And you want it powerful and easy to maintain, modify and extend. This upgrade is much appreciated. FileMaker User Interface got Some Goodies. FileMaker 14 was looking really good with its flatter design but FileMaker 15 goes one better with lots of detail work to make things work great for the user. Happy me! FileMaker Inc. release FileMaker Pro 14 in May. It is a major upgrade based on the same file format as FileMaker Pro 12 and 13. There is a free iOS version of FileMaker that goes with it called FileMaker Go 14 — it’s better by a good measure over FileMaker Go 13 — faster, more powerful and has a better user interface in a number of regards. FileMaker Inc., a subsidiary of Apple, is very serious about iOS support and you’ll see what I mean if you try it out. 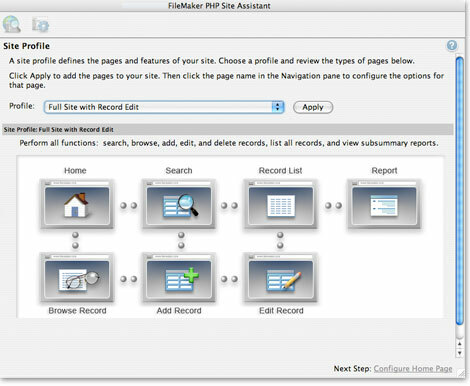 And don’t forget to check out the What’s New page on filemaker.com. Before I list the things I like best about this release, know that Macworld has given FileMaker 14 a thorough review and gave it their highest, 5 mice rating. Macnn concurs in their review. As does Computerworld. Last, Tim Dietrich has written an excellent overview of FileMaker 14 you will find to be a quick way to get familiar with its key new features. Script Workspace. As a FileMaker developer, my favorite feature is the new Script Workspace. The new workspace for writing and editing scripts is quicker and more fun. You get syntax coloring which makes your scripts a lot more readable. You can type and get autofills of the rest of a script step along with searching for steps. Really great. It will take a little getting used to but will be easy enough to pick up in a couple hours use. The Calculation workspace is much improved by auto-complete and function search too. Excellent Style Sheet and Theme capabilities. FileMaker Pro 13 is good with the styles and themes, but FileMaker Inc. kept going to took all this to another level in 14. Once you’ve styled your layouts, you can quickly change your entire database in a flash like the design software does. This lets you experiment with different looks and upgrade or enhance to look of layouts as you learn what works and what doesn’t. Better Buttons and Button Bars. My favorite is that you can easily and effectively put icons in your buttons now with a free 140-icon set included and the ability to design or purchase your own icons and add them to the set. Button bars add to the party and let you have say 5 or 6 buttons as one smart object that lets each button in the bar do different things but also respond as a group in a smart way — as you select one button in the bar the other buttons dim — that sort of thing. Web Direct is faster and can handle more concurrent users. This new feature in FileMaker 13 got more than 25% faster and now allows up to 100 concurrent users which will help when a web-based solution is the best option for a particular database. FileMaker Go 14. This is getting really fast and good now. Local area network use has gotten really good and wide area network use can also be quite sufficient depending on the application. Feel free to contact us by email or phone for more information. I love FileMaker Pro 13 and its little sister FileMaker Go 13. FileMaker has raised its game! FileMaker for the Web is here! Now you can take your FileMaker database and essentially turn a switch to allow web users to see and do the same things from a web browser. No coding! There are a few restrictions, but very few. FileMaker’s fairly limited and clunky Instant web publishing was cool when released years ago but is now obsolete. FileMaker Pro 13 lets you make your database look great and to your taste quickly and efficiently. You no longer have to change layouts one at a time. CSS-based themes can be applied to all or some of your layouts in one stroke. You get much more control of the visuals with end-user tools. You don’t have to get into coding things in order to control fine points like inner and outer shadows, gradients varying them by object state like hover and active. You can make your database look like an App. Especially in iOS! Touch friendly FileMaker Go. Two finger swipe to change records and flickable, sliding panels. FileMaker Go 13 is a big upgrade for iPhone, iPad and iPod touch. This upgrade makes using FileMaker Go fast and responsive. You have to try it and FileMaker Go 13 is free so get going! As mentioned above, FileMaker Pro 12 is a major, major upgrade. The two big-ticket items are a much better user interface development environment and a much more robust FileMaker Go for iPad and iPhone that is now free. If you have any interest at all in the possibility of using your existing database on an iPhone, iPad or iPod touch, don’t miss FileMaker Go 12. 1. Forty really cool layout themes that make snazzy-looking layouts possible and really easy. You can try out the different themes with one after the other. If you have an existing layout developed before FileMaker 12, it gets made over before your eyes. Neat stuff! 2. As mentioned above, wicked good layout tools that allow you to do things only designers could do with full-scale design programs before. And the tools are easy to pick up. 3. Required to run FileMaker Go 12. FileMaker Go 12 is so much more robust, faster and fun to use than FileMaker Go 11 that it is a must have. If you want iPhone or iPad access, you need Pro 12 to do anything other than run an existing filemaker solution as is. And it has to be a 12 solution to run. FileMaker is meant to be customized. So, yes, get at a copy of FileMaker Pro 12 to tailor your solution for your needs. 4. Better Container fields for media. FileMaker Inc. is aggressively improving their support for media here. There’s special functionality for PDFs which I love. Inserting them by drag an drop in FileMaker Pro and lots of other good stuff here. Don’t miss this. 5. Execute SQL Calculation Function. Not for the faint of heart but this new function lets you leapfrog into the big leagues of SQL without leaving filemaker. What this allows is a way to do some heavy-duty number crunching that would too slow otherwise right in your user-friendly, even lovable database. These are my favorites. They make me very, very happy to be a full-time FileMaker consultant and developer. If you have any questions about all this, I am available for a free consultation by phone to get you over any hump. Reach me to set up a call at Janet’s Email. Wow! We heard about a possible FileMaker iPhone app over a year ago. I’ve been waiting patiently having no idea what we would get. And then the iPad came out and I wondered, would that slow down the iPhone release. Anyway, both the FileMaker Go apps are out. You pay $20 for the iPhone app and $40 for the iPad app. These are great new releases! 1. This a cheap way to access a filemaker database. Filemaker Pro is $300. Casual users may not need more than this. 2. You now have a way to have an iPhone and/or iPad app for your business! 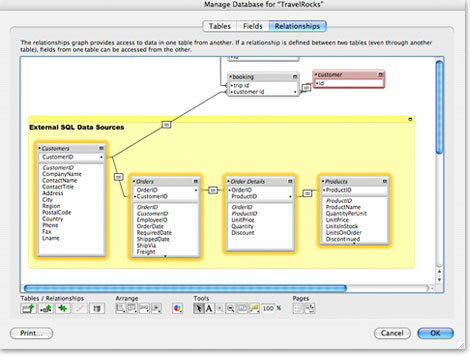 Easily customize the database in FileMaker Pro. 3. Although not every single FileMaker Pro feature is supported. Most of them are. You can see a list what is and is not supported at filemaker.com. 4. If you already have a FileMaker Pro database that you find useful and you want to access it in your office via iPhone or iPad, you really should create some layouts that fit the size and characteristics of these great little devices. The first thing is that the screens are smaller. The second thing is that the fingers that touch the screen are way bigger than the mouse or trackpad pointers you are used to on your Mac or PC. Buttons need to be bigger and there’s less room, so you benefit by simplifying and prioritizing what you want most on that smaller playing field. 5. One last thing, if you run complicated updates on your database, don’t allow the iPhones or iPads near them in most cases because all it takes is a phone call, text message or other distraction and the user — even you when not thinking — can terminate the update while in progress and leave your database in shambles. 6. We are here to advise if you have some questions. Free advice unless otherwise specified. These features and improvements are new to FileMaker 11. If you have an earlier version than FileMaker 10, read what you’ve missed below my FileMaker 11 list. 1. Layout Manager. It’s called Manage Layouts. You can now leave this great tool open while continuing to work with the database and do other things. You can drag layouts up and down the list and organize them into folders. You can duplicate an item in the list a layout and get the duplicate right next to the original layout. Huge time savers all. 2. Built-in Charting. I haven’t used this feature all that much yet, but it sure is great to not have to worry about adding a separate program to get a chart when you want one. The charts look really good with many nice themes. 3. The Inspector. You now get up to 3 inspector windoids that hold all the ways you can modify layouts. Many of these are faster to use than before. The inspector is customizable – you can have some portions open and some closed via disclosure triangles. 4. Quick Reports. These are reports that don’t require a preview. You can define sub-headings, subtotals and grand totals and view them in browse mode now. Table View has gotten really good as a new option for viewing your data. 5. Quick Find. Cool. You can type into a single box like doing a google search and FileMaker will search in all its fields on the layout you are on. Second cool thing about this – it is customizable so you can select fields you don’t want searched giving you an even better than search everything capability. 6. Object Badges. Way cool to be able to see all the special modifications you’ve made to objects on your layouts with these nifty little badges. There used to be a couple badge types, now there are a bunch of them. See which fields have tool tips, which ones will be searched in a quick find, which ones have conditional formatting, etc. 7. Variables in Find requests. You can grab information from various places in the database, from the user, from another table, combine things and put all that in a Variable which can then be put right into a Find request. Very powerful and flexible. You won’t get stuck in a cul de sac wondering how to tackle a tricky find request anymore. 8. Editing Scripts got Easier. OK. It’s not easier to actually figure out a script, but it is easier and quicker to get to the script that you need to change. My absolute favorite place to get access to script editing is from the Button Setup dialog. You are in Layout mode and double-click a button that runs a script. Right there you’ll find a widget that takes you to the script edit window. FAST! Sometimes I wonder how I managed using FileMaker in the old days. There have been so many improvements over the years and versions. FileMaker’s What’s New in FileMaker 10 page and even better is their FileMaker 10 Video Tutorials Page. 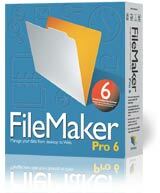 FileMaker 6 Users. 5 upgrades. A whole new world of possibility, functionality and ease awaits you. If you have a complex FileMaker system developed in FileMaker 6 or earlier, there may be extra work involved to get your old database running perfectly on FileMaker 10. FileMaker 7 was almost a complete rewrite on the inside. The best bet would be to open your files in FileMaker 10 and then test to see if everything works. If a few things don’t work, see your local consultant for an estimate. FileMaker 7 Users. 4 upgrades. I highly recommend that you upgrade to FileMaker 10. It’s an enormous upgrade. FileMaker 8 Users. 3 upgrades. Go for it. You’ll get native tabs that will give you much greater facility with less effort in formatting your entry screens. Conditional formatting will color-code any database dynamically to draw your attention to urgent matters. You’ll get the ability to save Finds, persistent Sorts and a customizable toolbar for each user. 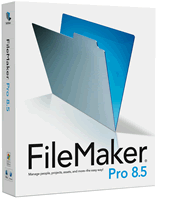 FileMaker 8.5 Users. 2 upgrades including conditional formatting and better backup verification in FM9 plus saved Finds, persistent sorts, quick reporting in browse mode and a much more powerful and granular File Recover capability to ensure the safety of your data. FileMaker 9 Users. FileMaker Inc. has given even FileMaker Pro 9 users a lot of good reasons to upgrade once again (that’s why I highly recommend you become a Maintenance customer). The new extremely powerful Recover command is something you’ll want when that rainy day hits. Or how about saved Finds for each user plus persistent sorting everywhere! Or the new customizable toolbar so your favorite commands are at the ready? Version Comparison Chart Available. FileMaker has made a great little chart showing all the features added over time to FileMaker going all the way from FileMaker Pro version 4 released in 1997 through to version 9 released in July. Control or right click to download the pdf. Can Serve Up to 9 FileMaker Clients without FileMaker Server. I am a big believer in FileMaker Server, especially with the awesome FileMaker Server 9. However, sometimes money is an issue. In FileMaker 7 and 8, you could serve up to 5 FileMaker clients with a regular copy of FileMaker Pro. Now you get up to 9!!!! Send Link Command. End user feature alert. Now there’s a new command in the File menu. You can send a URL to another user who can use that link to open the file you are using right then. 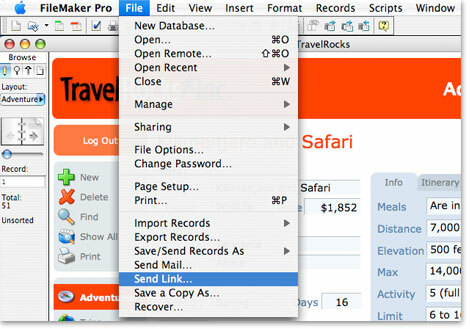 FileMaker 9 creates a new email with the URL in it. You can then add your own comments and send it out to users. No work at all associated with implementing this good thing. Append to PDF. This seems like a small thing until you realize that, now that we are emailing rather than mailing most documents, we need easy ways to send multiple pdfs as a single pdf. Without cracking open the heavy artillary from Adobe. For example, maybe you want a coversheet for your summary report or an addendum or detail backup to go along with the invoice. All the goodies that FileMaker can create with a button click can now be combined into a single pdf document for the purposes of emailing it to the one or more interested parties (like clients and bosses!) you need to work with. Auto-Resizing Layout Objects. Major cool! Now you aren’t stuck with a screen that is fixed in stone in terms of how big or small the type is. When you use a really small screen, things get smaller and when you have more screen real estate, you can expand the window and everything gets bigger automatically. You do need to use the fancy new layout tools to set your objects to expand, but it is dead simple. Another one of those, user-modifiable new features that address a long-standing need. This feature will come in handy if you have someone who really needs bigger type due to eye fatigue or near-sightedness. It also helps for the sharp-eyed mobile crowd who want to see the data as compactly as they can. PHP Support. FileMaker already has Instant Web Publishing and Custom Web Publishing. If you are interested in publishing aspects of your database to the web to collect information from web-based users or to allow them to see certain FileMaker database information, you’ll love the new PHP support. This feature does require FileMaker Server 9. It is there where you will find the new PHP site assistant. It lets you create clean and simple PHP-based web pages in seconds. The especially cool thing here is that your PHP-based pages have no limits to customization. They can be as fancy and elaborate as you want. Also, the pages use CSS (cascading style sheets), so you can make them look just right. Conditional Formatting. This new feature makes it much easier to make a field turn to a different color, get bigger and other style options when a certain condition becomes true. For example, the number of days elapsed since an invoice went out could turn red when the number of days exceeds 30. This is an end-user level feature. Simple to change. No hard stuff. Quick. Easy to experiment with. Connect to External SQL Data Sources. If you have a web site that writes to a MySQL database or wish you did, you might like this feature. If you want to take advantage of Corporate database information in MS SQL or Oracle, you are in luck. This is insanely easy access to SQL data. You get to put external data in your relationships graph and then work with it as if it were local in creating reports and even writing data to the SQL db. This is a little more advanced, but incredibly easy if you already know how to use the relationships graph. FileMaker Server 9. I’m not a Macintosh systems geek. I slide by on my extreme FileMaker knowledge. As a result, my clients don’t usually call me in to set up their FileMaker Servers. Good thing or at least it used to be. Now, with FileMaker Server 9, I will look good. Some of them might not know they can do everything themselves without calling in the IT types. FileMaker Server 9 is getting rave reviews from the FileMaker community. It is really, really well done. It’s got wizards that walk you through a lot of stuff that isn’t covered by FileMaker Server 8 and previous. This is my kind of tool! Geeks, get outta my way! Scriptphoria. (1) Keep your scripts neat and tidy. My Studio Manager product has over 500 scripts. Now I organize them into folders that can be collapsed like an outline. Really nice. No more paging and paging to get from one script to another. (2) Keep your scripts window open while you work with your database. (3) Multiple script windows open. FileMaker Pro 9 Advanced Debugging Tools. Two cool things here. (a) The Data Viewer just got twice as smart. Now it has a whole new Current tab that lists all fields and variables addressed by the currently executing script. You won’t have to add them in manually. (b) Script Debugger rocks more. You can set scripts to automatically pause when a script error occurs and figure out the errors on the fly. It helps too that you can now run script debugger with lower level privileges and debug privileges problems. What we didn’t say about FileMaker 9. The following are additional features you will get in FileMaker 9 that came out in FileMaker 8.5. Now that FileMaker 9 is out, you will want to upgrade all the way to 9 as 8.5 was just a stop along the way. Web Viewer. Now you can access web pages and specific web information right inside your filemaker database. For example, you can show a google map of your customer, prospect and vendor contacts as you flip through their contact records. Very cool. Also, you can do a little bit of specifying to get specific information from websites like Amazon or FedEx. FileMaker includes several of these bits of code for you and they are editable as text. Universal Provides a Big Speed Bump. You are going to want FileMaker 8.5 for your Intel Mac. The speed improvement is extreme. FileMaker zips like you’ve never seen it before. Object Functions and Scripts. FileMaker 8.5 lets you assign names to fields, tabs and other layout objects. Once named, new script capabilities let you execute different script functionality depending on which tabs or fields are active. You need this extra functionality to take full advantage of FileMaker 8’s new tab controls. You Need it to Run Studio Manager 8. Studio Manager 8 uses tab controls extensively and needs FileMaker 8.5’s extra features to do so. FileMaker 8 Advanced is Fantastic. It puts spit and polish and lots of great new features on top of the excellent, robust foundation of FileMaker 7. 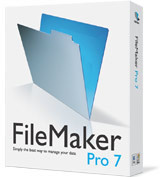 FileMaker 7 provides a huge canvas on which FileMaker Inc. could express itself. And they did. 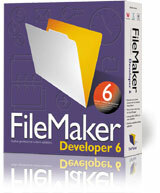 FileMaker 8 Advanced is worth having in just about every shop. 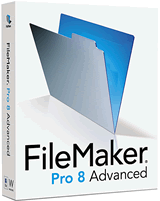 If you have one copy of FileMaker 8, make it 8 Advanced. Even if you aren’t technically advanced, you could have a FileMaker expert walk you through implementing all sorts of good things over the phone. Here’s a few of the reasons to upgrade from 5, 6 or 7. Clairvoyance. Look out Quicken, we can fill in the blanks with the best of them now. Drop-down lists with arrows. This gives you the user the best of both worlds. You can use a menu or just type freely relying upon clairvoyance to fill in the rest. There are no better, easier-to-use drop-down lists than these and you can implement then by clicking a single checkbox. Tab Controls. Now you can give yourself a self-sufficient little tabbed area on your screen in 30 seconds. Draw a rectangle on the screen. Type the names of the tabs and you are done. And you can make them look good too. Don’t just take the default style. Custom Menus.Just give yourself and your staff the exact menus you want. Take some off the list instead of having to have them all on or all off. How binary of them. Now you get to pick and choose. Take off some of the scary commands for your more casual users. Give yourself some of your very own keyboard equivalents finally. You can even customize the famous Cmd-F Find command to run exactly how you want it to. It’s scriptable. Importing Tables. Tired of having to manage and work with 10 or more files every time you want to do the simplest things with your database? In 8 Advanced, you can import all the secondary tables or just all the tables into a single file. Think of how easy backup gets. Write to Excel Directly. You could already open Excel files directly. Now you can write data in Excel format. No hassle. Calendar Date Picker. Another one of those just click a checkbox options for any date field. Double-click the field. Select Calendar Drop-down. Done. But check the icon checkbox too just to make it even sexier. Send Mail. You can send emails to a group of select people in your database on the fly. Choose Send Mail and fill in the boxes with data from your database or your own typed in message and subject and click OK. That creates emails in your email program and then actually sends them out for you – with attachments, cc and bcc. 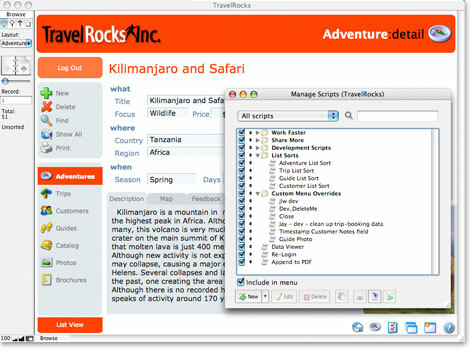 Instant Finds and Sorts.FileMaker Inc. took the gloves off in delivering even more ease of use than before. They questioned everything and looked under every rock and came up with Find Matching Records and a Sort dialog that defaults to only showing you a list of fields on the current layout, not ALL the fields in the whole database. The instant find is accessible by control- or right-clicking into a field. You get the option of finding every record with the contents of your current record. Click into the San Francisco in the city field and choose Find Matching Records. Done. Or keep going with all sorts of other instant finds. We are definitely not in Kansas anymore, Toto. FileMaker 7 is a horse of a different color. It is magnificent and bold. It is powerful beyond measure. It looks good and feels like our tried and true FileMaker we are used to. And, it’s going to take a good 12 months to learn its secrets. Meanwhile, those of us who live, eat and breathe FileMaker, will straddle the fence between FileMaker Pro 5 and 6 and 7. We, at Tokerud Consulting Group, are studying the tutorials, white papers and technical briefings and have attended a day of training at FileMaker Inc. We’ve tried converting a couple applications with mixed results – which is to be expected. We are as excited as all get out, but are going slowly because any existing relational application will probably need special extra work before and after conversion to get it to work correctly. And, if you want to take advantage of all of FM7’s tricks, you’ll probably need to be building from scratch or swap old sections for new sections over time. Give us a few days, and we will have much more to say about this new wonder. Stores any raw data file in a container field including Word, Excel, pdf, you name it. Scripts and calculations can style and color text. You can create a full-featured password and privileges security scheme with much less effort. You can filter portals by date, time, and other criteria. Relationships can be created much more quickly (1/10th the time). You can open multiple windows for a single file so you can see a single record and a list at the same time or compare two different records side by side. You can exactly control the size and placement of windows. It’s fully multi-tasking. You can be running a report in one window while you do a Find or data entry in another window. Portals can be split into segments: rows 1-3 here and 4-6 there etc. giving you much more flexibility in how you display information on the screen or in a report. Much more powerful, easy and FileMaker-like web publishing. If you are a FileMaker developer of any kind, this product is well worth the cost for three major reasons. 1) It gives you a powerful documentation tool that helps you see all the elements of your databases and how they interrelate. It makes it easier to find your mistakes and is a great tool to help you clean up outdated stuff (like all those old layouts, remember?). 2) It also includes a tool that can create run-time FileMaker databases. 3) The developer tool lets you change file names in multi-file databases and automatically changes all of the script and relationship references to go with the new name. Any serious developer should at least have the FMP Dev 5.5 program if not FMP Dev 6.0. Paid up members of the FileMaker Solutions Alliance now get the latest version of FileMaker Developer with their membership. 1. Customizable dialogs. Up until now, you could only create a dialog with three buttons on it. You couldn’t prompt for free-form data. Now you can stop creating extra layouts every time you need to prompt for non-multiple-choice data. This is a big timesaver and makes the database less complex – always a good thing. 2. Another feature of customizable dialogs… you can now use field information in the dialog text. 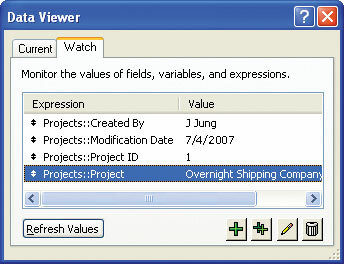 For example, the dialog could show the company name the user is reporting on when it asks the user to select particular report options – this way the user doesn’t forget where he or she is. 3. Global Find and Replace. Now you are not limited to finding in one field at a time. You can a particular word or name in all fields or a limited set of fields. results as you go along. Every so often, you absolutely need this feature – and now it is here! 5. Has more complete and robust ODBC and XML functionality. This means we can retrieve and update data from web services or big corporate databases. 6. Little tweaks throughout fine-tuning the ease of use and functionality. 7. Direct importing of graphics and mp3 and other kinds of files, a whole folder at a time. Thanks! 1. Runs in OS X.
and scripts windows and they remember the size you’ve set them to. better and 20 script steps can be executed with filemaker buttons. restrict a user to seeing and modifying only his own records. and export ODBC data. This really helps when you need to exchange data. 8. More powerful script import capability. lets you reset the next serial number easily. 5. Resizable windows field definitions and scripting. 10. Value lists can be shared by multiple files. I run Filemaker Pro 11 but a client on Filemaker 6 needs his invoice layout redesigning. The functionality is all working fine, he just has a new logo to design around. Once I open the copy of his file it will convert to 12, of course, but how do I save it back so he can apply it to his database? I worked with you years ago. Wonder if you could tell me what I would need to do to get my 8.5 database to work on Mavericks? If your FileMaker 8.5 database is running well now, I would recommend upgrading to FileMaker Pro 13 once you’ve done a trial conversion and are satisfied that it is still working ok in 13. You can do your trial using the free trial version of FileMaker Pro 13. You’ll probably find a few minor issues but nothing serious enough to deter you in the conversion. Let me know if you need further advice. You can reach me at janet.tokerud@gmail.com. All the best.